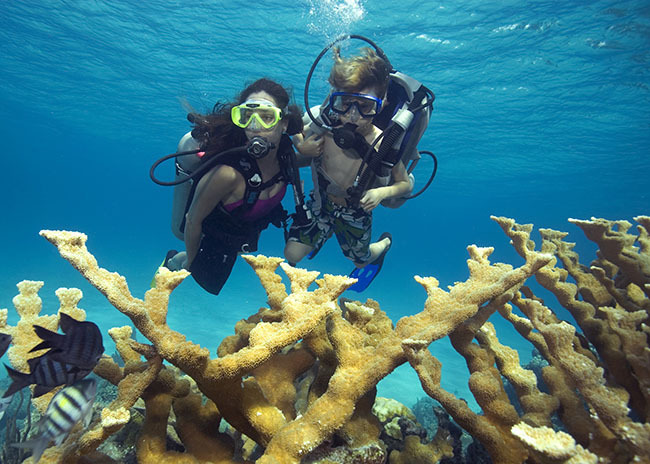 Scuba Dive Among One Of The World’s Most Beautiful Coral Reefs –No Scuba Diving Certification Needed! And that’s particularly so, because you can scuba dive here without the need for full certification. 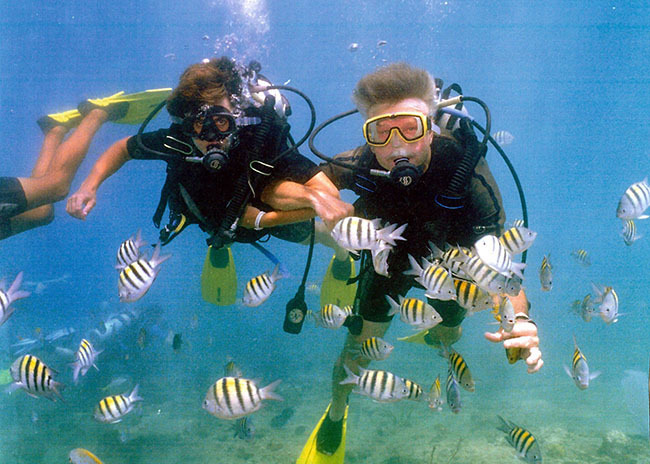 Or perhaps you are already fully certified and want your non-diving friends to experience the sheer wonder of it all - almost like flying in that warm sensuous ocean with feeling of total freedom while they marvel at the breathtaking beauty of the coral reefs and the sheer abundance of the dazzling tropical fish that dart in and out of the coral. This was my first dive and I can’t wait to get certified. Alberto was my dive master that day. He was very patient with me even as I was getting frustrated with myself. He answered all my questions and was very detailed. Alberto went out of his way to arrange his schedule so that I could have an awesome vacation experience. I was served fresh fruit and beverages after my dive at no cost. If anyone is interested in doing any diving in Cozumel, Alberto is the guy to visit. He will even go well out of his way to accommodate your needs. His communication is excellent, emails timely and informative, and I was totally impressed with all of my interactions with him. The experience is amazing and the service exceptional. I look forward to diving with Alberto in the future. You see, although our professional P.A.D.I. 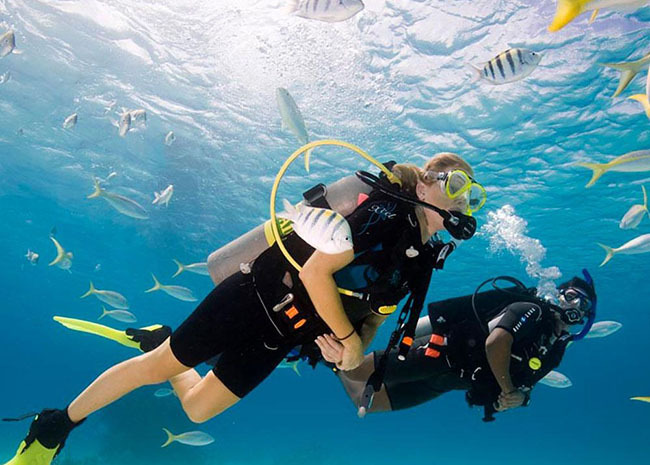 scuba diving instructors are licensed to tutor up to six novices at one time, we limit this to roughly half that number to ensure you enjoy a truly private experience. Don't go on a big boat - Go with these guys!" One of the things we really appreciated about Alberto was the size of his groups(6 people or less each day). It seemed like all the other dive outfitters had huge boats stocked with 20 guests, moving them around the dock, boat, water, etc., like a big herd of people. Without a doubt, next time we go to Cozumel we'll be diving with Alberto and his crew again. Hola … my name is Alberto Novelo and – along with my brother, Roberto and cousin, Carlos and the rest of my family – I have great pleasure in welcoming you to my beautiful island of Cozumel where we have famously been providing the longest running and very best scuba diving tours since 1995 (23 years), having a combined diving instruction experience between us well in excess of 50 years. What’s more, we are unique among all the scuba instructors on Cozumel, being the ONLY scuba diving tour where the instructors and boat crew all speak fluent English. And we hold an American English ‘Test of English as a Foreign Language’ certificate – unlike many other diving instructors in Cozumel. Much better than the Cruise Ship Diving Experience"
Just spent a day diving with Alberto and his brother Roberto in Cozumel. Alberto brought my wife and I to two different dive sites and we had a wonderful time. Alberto is patient and thorough in his instruction. While this was not our first discover scuba dive he spent the time to refresh our skills and made both dives very enjoyable. We did back to back dives and Alberto assured us we would make it back to the cruise ship on time. You were right Alberto...and we're glad to have completed two dives in one day. We loved the experience and would highly recommend Cozumel DSD to anyone on a cruise ship that wants to give scuba diving a try. You will not regret it and Alberto will make it a great experience. 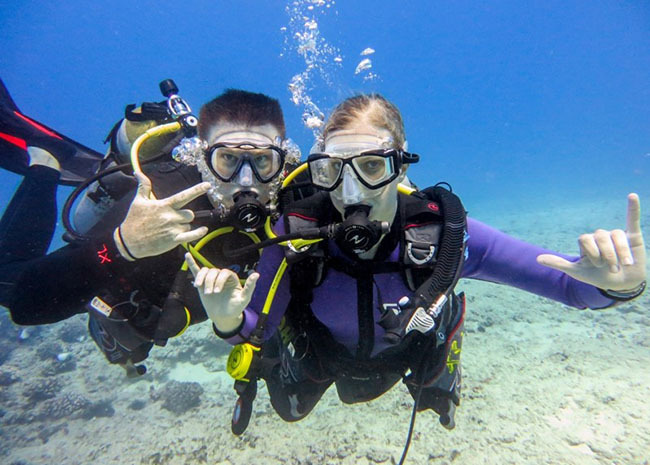 Almost 50 years old and new to Scuba Diving"
My wife and I are almost 50 years old, but new to SCUBA. Alberto was so patient and understanding with each of us and spent a lot of one-on-one time with my wife to make her feel comfortable with the whole experience. On a 100 point scale, Alberto would get a 100 point score. The whole trip was wonderful, great spot to dive, quick boat ride, quality of gear, and ease of getting to and from the harbor, but Alberto’s quality teaching and patience made the trip the highlight of the cruise. Excellent First Diving Experience - Even for Kids"
This was our first trip to Cozumel, and our first time scuba diving, but it certainly won't be our last ! I came with my two two young daughters, and had contacted Alberto in advance of our cruise mainly based on his many excellent reviews on Tripadvisor. The reviewers were absolutely right, he is a great guy, and an excellent dive instructor. He was particularly great with the kids, who were a little nervous about their first dive. Our trip to the Paradise Reef was unforgettable, or in the words of my 12 year old... That was the coolest thing I've ever done, in my whole life. Hope you enjoy your trip as much as we did and say hi to the crew for us! 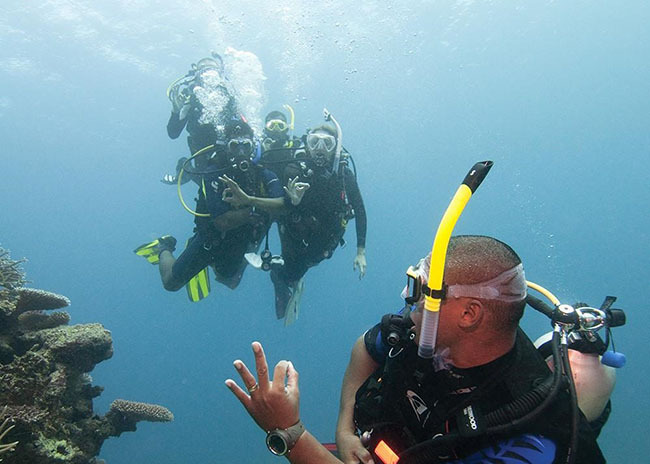 The Discover Scuba Diving experience is the perfect program for those looking to try something new this year. 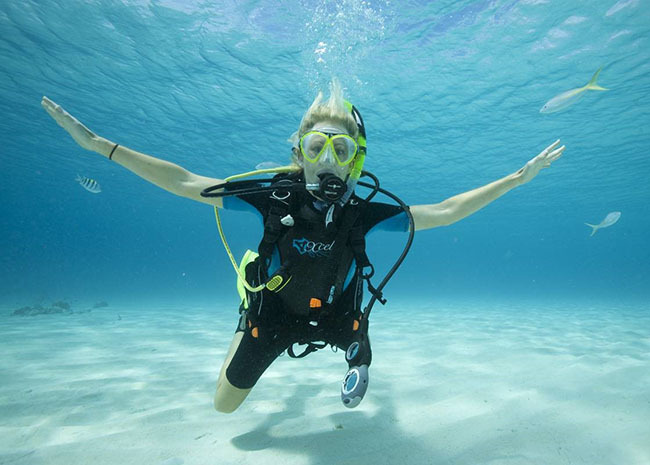 It is designed for those who have no experience with scuba diving, but want to know what it’s like to breathe underwater. 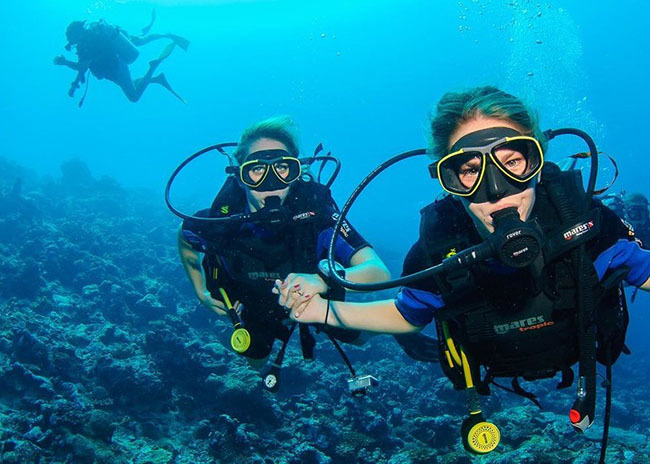 While this program is not an actual certification course, it will open your eyes to new possibilities and give you a taste of how much fun it is to scuba dive. 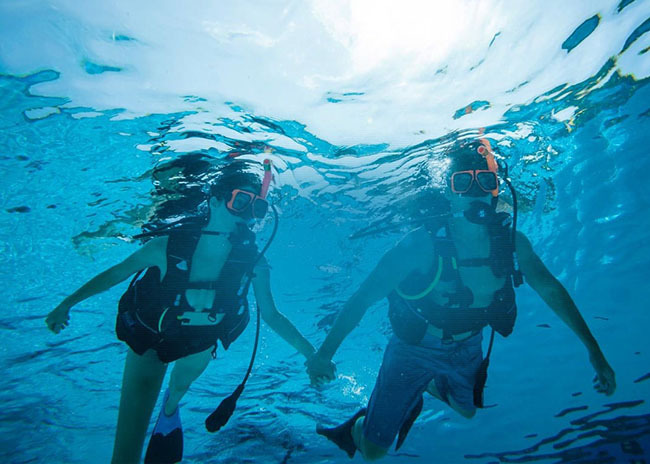 During the Discover Scuba Diving program, you’ll learn what it’s like to wear scuba equipment, basic safety rules and how it feels to breathe underwater. Excellent Personalized Service makes CozumelDSD a Great Bargain"
My wife and I had no prior dive experience or certification. We chose Alberto because of the small size of the operation and knowing that we would be under a watchful eye rather than part of the crowd on a big boat. I think we made a great choice. Alberto was patient and helpful which eased us back into the "dive groove". We felt no pressure due to our lack of experience and our comfort level soared during the two days that we were able to dive with Alberto and his brother Roberto. With the small group we were able to stay as long as our air permitted and then surfaced with our buddy rather than at a preplanned time limit. The things that made Cozumel DSD a good value for us were the small size of the operation which allowed (and delivered) personal service and maximum bottom time within our ability. Other perks were the faster boat which allowed a quicker trip overall, first choice of dive sites, and shore time for the surface interval; the great personalities of Alberto, Mario, and Carlos; and the fresh fruit and drinks after the dive. We would highly recommend Alberto, for new divers because of the personal attention. 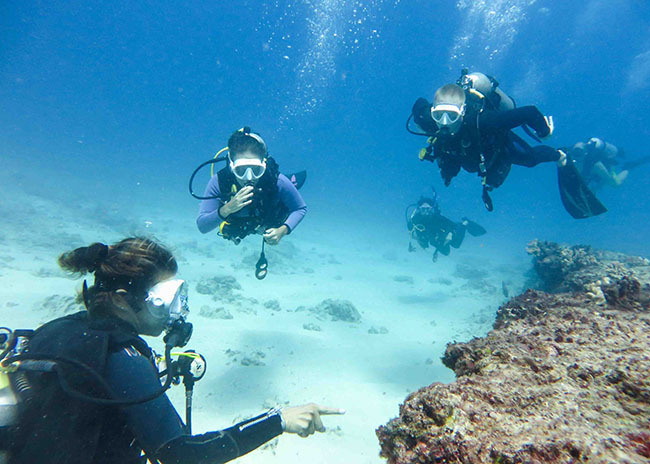 What makes our Discover Scuba Diving Program so unique? We are a family owned business & most of our Divers are family members. This means we are far more motivated to make your day wonderful in a way no employee could ever be. All instructors and boat crew speak fluent English and we hold an American English ‘Test of English as a Foreign Language’ certificate. Although our P.A.D.I. 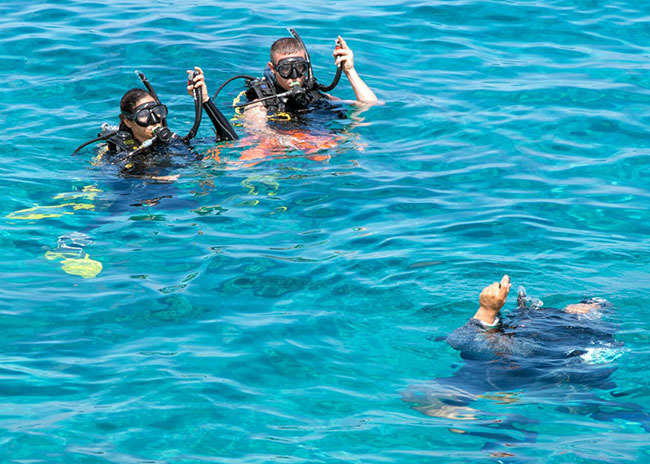 certified instructors are licensed to handle up to six novice divers at a time, we limit this to around three to make it far more personal for you. While other diving companies will charge you for refreshments, we supply soft drinks and fruit at no extra cost. Our fleet of eco-friendly boats are nearly the only ones allowed into the highly protected Cozumel Marine Park. So while divers with other companies will find themselves merely diving in a hotel pool or elbow to elbow with many other divers in the far inferior reefs outside of the park, you’ll probably have the whole of the stunning Paradise Reef to yourself, apart from the other one or two divers in your party. Discover Scuba Diving from Shore - 1 tank Dive at a Reef accessible from Shore. 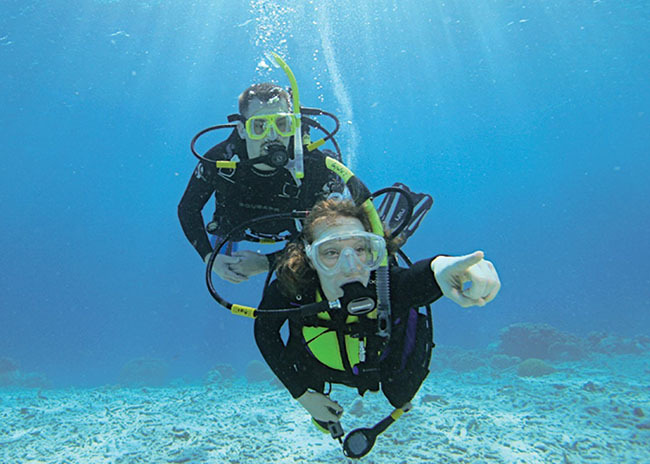 Discover Scuba Diving Plus - 2 tanks Dive at a Reef accessible from Shore. This reef is inside Cozumel Marine Park (Protected Area). Your tour lasts approximately three hours. We will meet you at the ‘Marti Sporting Goods Store’, which is just 50 yards directly across the street from the Cruise Pier, where the cruise ships arrive. If you are staying in a Cozumel hotel you’ll receive full directions how to get to our meeting point at the ‘Marti Sporting Goods Store’, immediately upon payment. If you’re coming from Playa del Carmen the ferry from Playa del Carmen will dock at the Ferry Pier in downtown, which is just a mile from our meeting point at the ‘Marti Sporting Goods Store’. You’ll receive full directions with your booking confirmation. You can take a gentle stroll along the shoreline or hire a taxi right outside the ferry pier. Please arrange to meet us at least ONE HOUR after the ferry is due to depart from Playa del Carmen to allow for the crossing and embarkation time. If you’re on a cruise ship you will arrive at the Cruise Pier, just 50 yards across the street from the ‘Marti Sporting Goods Store’. Set a time to meet us at least 30 minutes after you’re scheduled to dock to allow for the inevitable delays in embarkation. Wherever you’re coming from, you’ll receive full directions with your Confirmation Email that will be instantly sent to you when you book your trip. Is to get used the equipment in the totally safe environment of the diving tank. 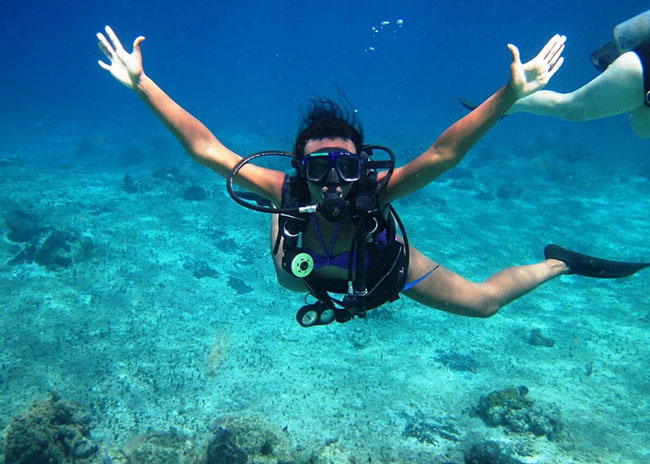 You’ll be delighted how well that goes and now you’re eager to try your new diving skills in the ocean! Be impressed how clean and well organized everything is. Then your excitement rises to fever pitch as the powerful marine engines burst into life and we pull away from the shore. 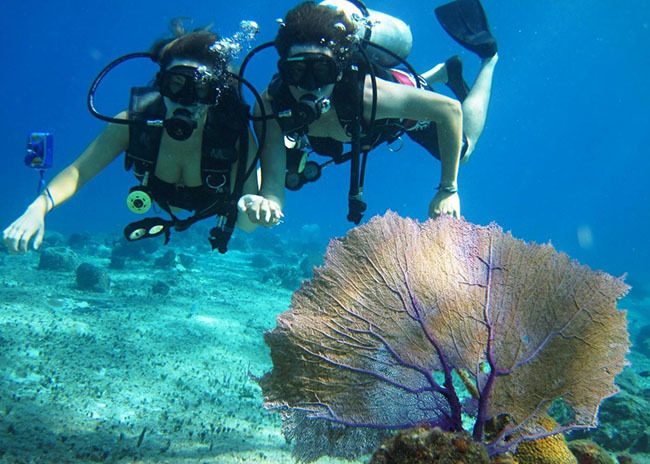 We enter the protected grounds of the world famous Cozumel Marine Park and are ready to begin your first ocean dive. And what a truly memorable experience that is. The ocean caresses you like a warm salty bath and the brilliance of the corals, the sponges and all the other coral wildlife make you gasp with delight. The depth of the water is only about 25 feet, which means sunlight still penetrates, lighting up the beautiful coral and sandy floor. It also means you won’t be in any danger of going too deep. In any event your instructor will be close at hand at all times to keep you safe. 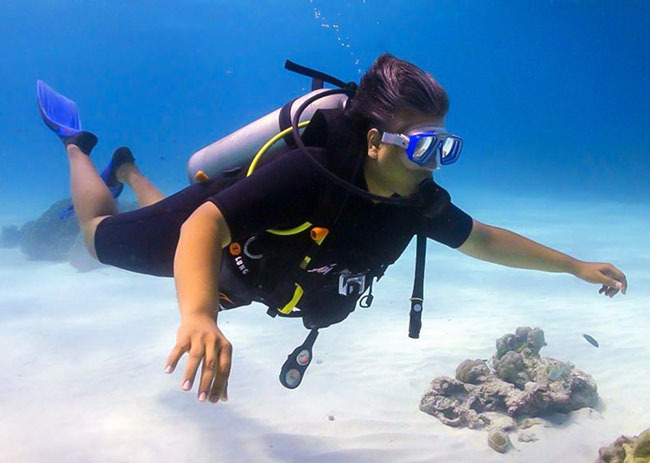 Your breathing underwater feels like second nature and you relax and enjoy the amazing feeling of weightlessness as you ‘fly’ among the brilliantly colored tropical fish. Keep a sharp eye out for a turtle or ray with its delta wings and graceful wave-like movement. It’s time to leave this amazing underwater world, and return to the surface. You’ll appreciate the chance to relax with a cool drink and some fruit, served with our compliments, as you excitedly swap your experiences with your fellow novice divers. We then return to base in good time for you to catch your cruise ship or ferry. The trip may be over, but the memories you’ve gotten will be with you for your lifetime. Because you book online, directly with us, we can slash your fees way down low – while, at the same time, providing you with a true five-star experience. Booking online also gives you the key advantage of being able to immediately see if your choice of a particular day for your trip is available. 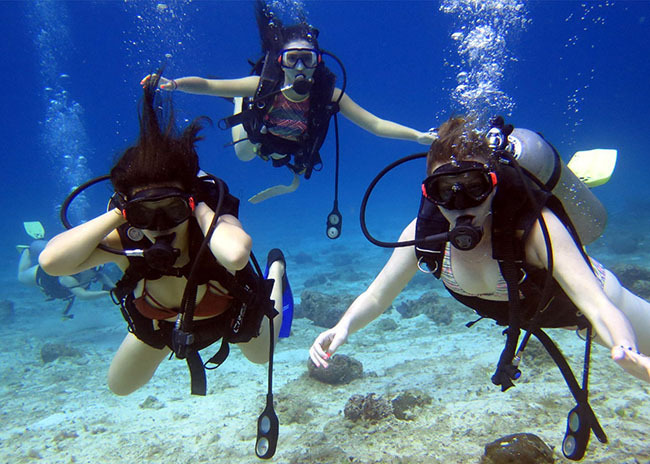 Last week 43 Travelers booked our PADI Program to enjoy Diving for the first time. Today it's your turn. Although you will be able to enjoy the many advantages of dealing with a local family owned business, it does have one severe downside, about which it’s only fair to warn you. Because we only have three P.A.D.I. instructors in the family and because we insist on giving a personal service they only take three divers at any one. That means a total of nine slots open daily which, with most of our clients come from the cruise ships, which bring in around 20,000 cruise visitors daily, quickly get filled up. You can either take your time to ‘think about it’ – only to come back later and find your choice of day has now been taken, so you either have to miss out completely or settle for trip with another diving company, finding yourself either limited to a dive in a hotel pool or elbow to elbow with hundreds of other tourists in the poorer quality reefs outside the Cozumel Marine Park. You can make the smart move and immediately decide on the day you want to take your tour on and [instantly check if we are still available – then book it, right away! Then, once you’ve made your booking, you can relax, enjoying the warm feeling of knowing you’ve made a very wise choice and start to plan to make your day a truly FIVE STAR memory you’ll cherish forever. Sounds like it’s an easy choice, so my family and I are really looking forward to meeting you and giving you your very first exciting scuba diving experience. 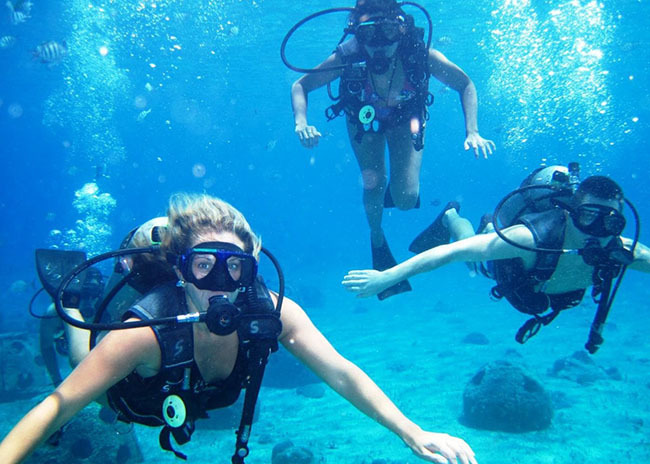 Over 40 Travelers just last week rated this DIVE Experience 5 stars. Are you going to miss it? Because we focus on giving you the highest possible personal experience, seamlessly delivered by our uniquely qualified and highly experienced fluent English speaking P.A.D.I. diving instructors we are strictly limited to a maximum of 9 slots a day. I’d hate for you to be disappointed by missing out on your chosen day, so I urge you to check availability right now and then book your slot right away. 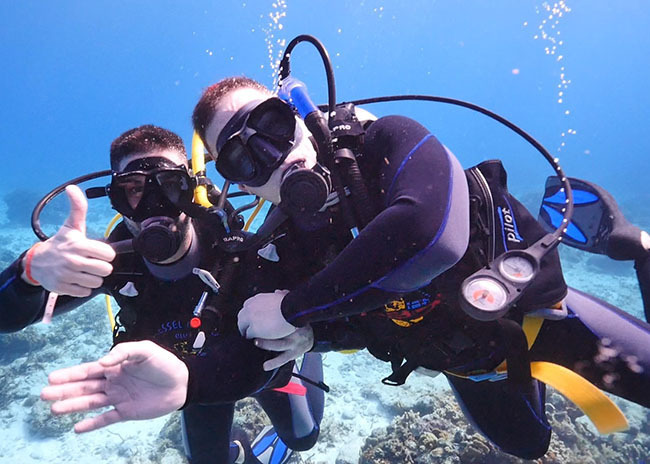 Diving with Alberto was like diving with friends - Personal and Relaxed!" Diving and snorkeling with Alberto was incredible! I am not a certified diver and he made sure he took his time with me and answered all my questions and was right there to show guidance. Very patient, explained concepts well, and took us to incredible reefs that were amazing! If your a certified diver or a beginner, you can't go wrong with Alberto and his crew. Personalized, attentive to needs/concerns, and a fantastic teacher! I'm sure we'll be back to dive with Alberto every chance we get.